Cesena is a beautiful, relaxed Italian town with narrow streets and countless old buildings. The seaside is just a 20-minute drive, and if you are a ski-aficionado, you can easily find quality slopes close-by. In short: it is a very nice place to live. In addition, Cesena is home to a number of faculties of the prestigious University of Bologna, attracting students from all over Italy. After graduation, however, most of them move to other countries, or to big cities in Italy, in search of more exciting career opportunities. So the question was, what could the city do to retain at least some of the talented university graduates in Cesena? One of the answers was the creation of an incubator 4 years ago, to attract and nurture startup enterprises and promote innovation. The idea came from a university professor - and the City Council immediately backed it. Co-working spaces, start-up centres and digital incubators are booming in big cities all over the world. They are less common, however, in smaller towns like Cesena. 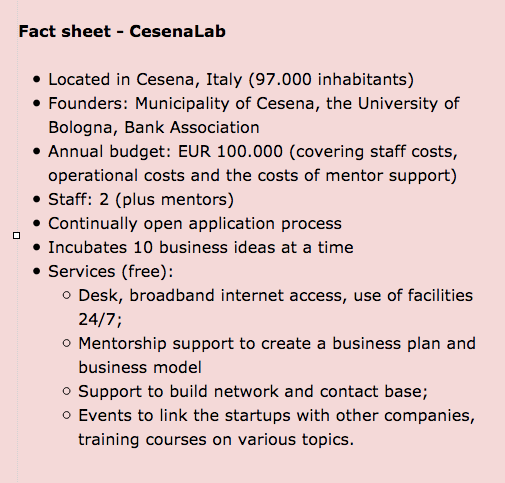 CesenaLab was conceived from the beginning as a simple, low-cost operation, and the founders - the Municipality of Cesena, the University and a Bank Association - focus on the basics. The Bank Association provided the space (free) - an unused bank office, the Municipality provides the annual budget of operation, while the University contributes with its network, occasional access to its research facilities and capacities, and of course with a healthy stream of aspiring startuppers from the university. CesenaLab has a digital and media focus. In addition to the support, however, the biggest value lies in the power of the community: people working at the 10 companies CesenaLab hosts at a time form a diverse group, with a wide range of knowledge and skills - and they help out each other on a daily basis. At lunch time almost everyone gathers around the big table in the centre of the open-space room and spend time together; there’s animated discussion, young people sharing ideas, solving problems together, and telling jokes. It is lively and noisy - just like a big Italian family - but it is probably one of the reasons these aspiring entrepreneurs love to be here. 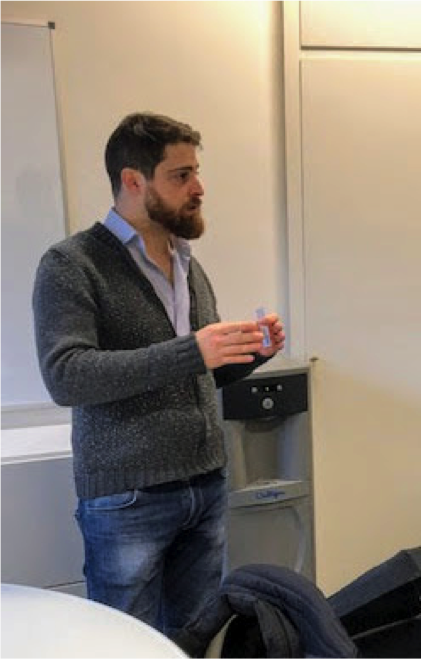 “Now you know what you eat” - this is the slogan of EDO, one of the first “graduates” of CesenaLab. The 3 young IT guys offer a solution to a problem most of us are familiar with: with the huge selection of food products on the shelves of supermarkets today, it is almost impossible to make an educated, responsible and healthy choice; too many alternatives, unknown ingredients, important information hidden in the corner of the package with minuscule letters - just to name a few of the challenges. The simple answer EDO offers is a mobile app, which - after scanning the barcode of the product - presents a health-index calculated based on the ingredients of the food and the goals of the user, and provides other crucial product information in an easy-to-understand format. Currently the EDO app is available in Italy and in the UK - and they plan to expand to other markets. Cesena is in an area with a strong agricultural tradition– so it’s no surprise that many startups offer solutions to food-related problems. 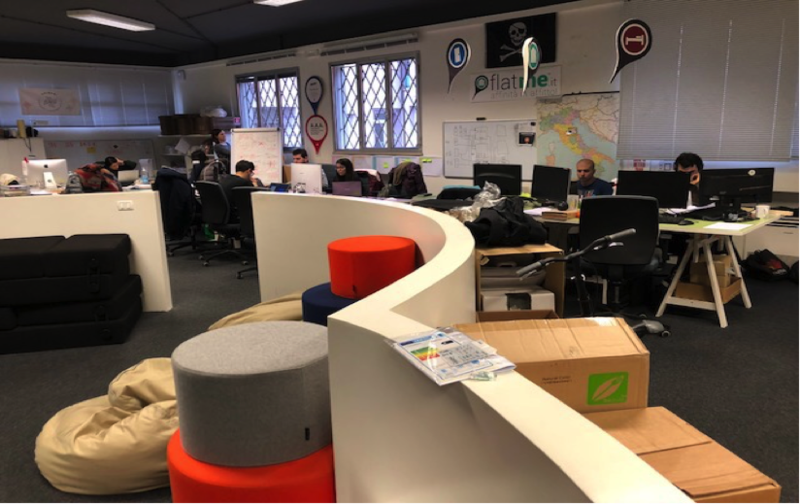 SeasonEat started in 2016 - it is a drop shipping service delivering fresh groceries (fruits and vegetables) to the table of Cesena residents from producers around the city. While one can find similar services in many places, it was new to Cesena when SeasonEat started. The service they offer is good for the customers - they receive fresh fruits and vegetables with known origin; it is good for the farmers as SeasonEat offers fair prices (much higher than supermarket chains) - and it is also good for the local economy. The company has a 2.000 strong subscriber base, steadily growing. They are not just an e-commerce solution and logistics provider - they organize events to build a community of customers and farmers. The next step is to scale the service to other Italian cities. Fitlunch is the initiative of a former professional athlete who - after finishing his sports career - immediately felt that healthy eating is a major challenge for people. Fitlunch.it is a meal delivery service - and it is like having a nutritional expert and a chef at your disposal any time you need it. You can connect to the service through Facebook Messenger. You need to provide some important information about yourself - your age, weight and height - your activity level, as well as your fitness goal (muscle building or leaning). Based on this information Fitlunch.it offers you various tailor-made meals - which you can order immediately. The company operates in 6 cities in Italy - all our smaller cities like Cesena and intends to expand further. …..but what’s all this got to do with Foo Fighters…..? Fabio is a marine biologist by profession - and a serial entrepreneur, building businesses around his passions. One of his many passions is music - more precisely rock music - and he is an avid fan of one of the greatest rock bands on earth - Foo Fighters. 3 years ago, he wanted to invite his favorite band to come and give a concert in his hometown, Cesena. Since Foo Fighters only normally perform in big city stadiums, Fabio knew that any old invitation would not cut it. So, he started to work on a dream: he collected money through crowdfunding, and then organized Rockin’1000 - 1.000 musicians - amateur and professional, male and female, young and old - gathered in Cesena to play together just one song - “Learning to Fly” from Foo Fighters. At the end of the video capturing this wonderful and moving community moment Fabio presented an invitation to Foo Fighters. The video went viral and quickly accumulated over 40 Million views - and soon Dave Grohl of Foo Fighters sent a video message thanking for the beautiful video and saying (in Italian) “We are coming. I promise”. And they did - Fabio’s dream came true on November 3 2015 when the band gave an intimate concert to 3.000 fans in Cesena. 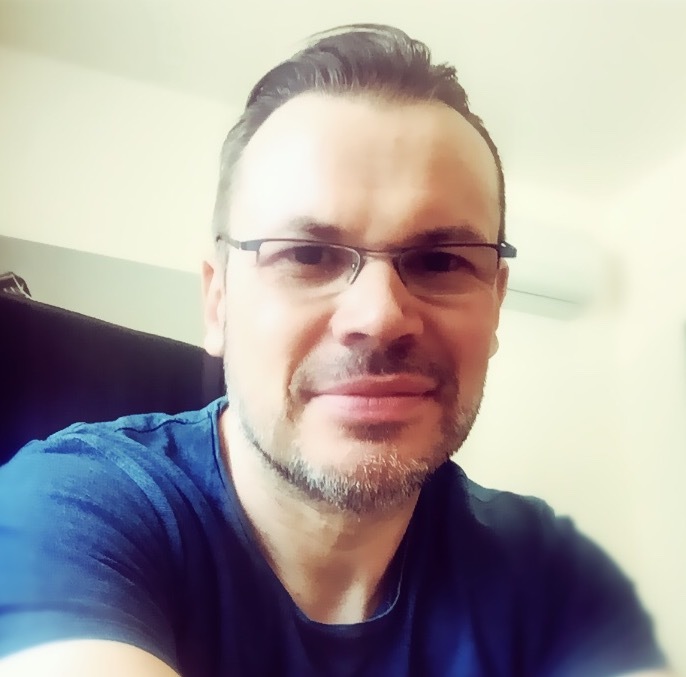 Fabio’s company built around the concept of Rockin’1000 is now a resident of CesenaLab - and together with his small team he continues to make the dream of amateur musicians come true. They organised a show of the Biggest Rockband on Earth - 1.200 musicians from all over the world performing to an audience of more than 12.000 in the Cesena stadium, produced a record of the show, organized a summer camp for musicians. As Fabio insists, however, Rockin1000 is not an event organizer - its building a worldwide community of musicians. The inspiring example of these initiatives show that all towns and cities – whatever their size and location – can reach for the stars and achieve big things. What is needed is creativity, ambition, energy and fun - and CesenaLab has all of these in spades. What can you do in your area…?